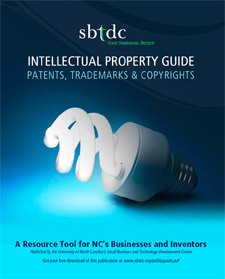 Our Intellectual Property Guide is intended to help small businesses and inventors in the development of their inventions and in the maintenance of their intellectual property rights. Maybe you’ve already developed an invention. These questions must be carefully considered in order to get the full benefit of the efforts put into developing an invention. The purpose of this guide is not to discourage you from proceeding with any particular option, but to educate you about different ways to proceed with your idea and the potential time and financial investments that may be involved. This guide will educate you about patents and provide helpful references and sources of assistance that you may need in order to be successful. We emphasize the utilization of resources at local libraries, universities, and on the Internet. In addition, this guide explores trademark and copyright issues and the protection of internet domain names.